Darlinghurst Dental has always tried to minimise our footprint by using environmentally friendly material. Our latest initiative is to use environmentally friendly products made from degradable plastic. Plastic barriers have become widely used in dental practice and the health industry to assist with infection control. They are an effective way of protecting equipment and surfaces to prevent cross infection, minimising the use of surface detergents and disinfectants. 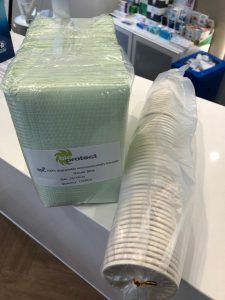 Darlinghurst Dental has moved to use the degradable plastic products from Bio Protect who provide our patient water cups and bibs. Better for patients and better for the environment. We are aways looking for new ways to minimise the impact on the environment without sacrificing patient safety or care and will provide further updates on new initiatives. For more information about degradable plastics from Bio Protect – click here.